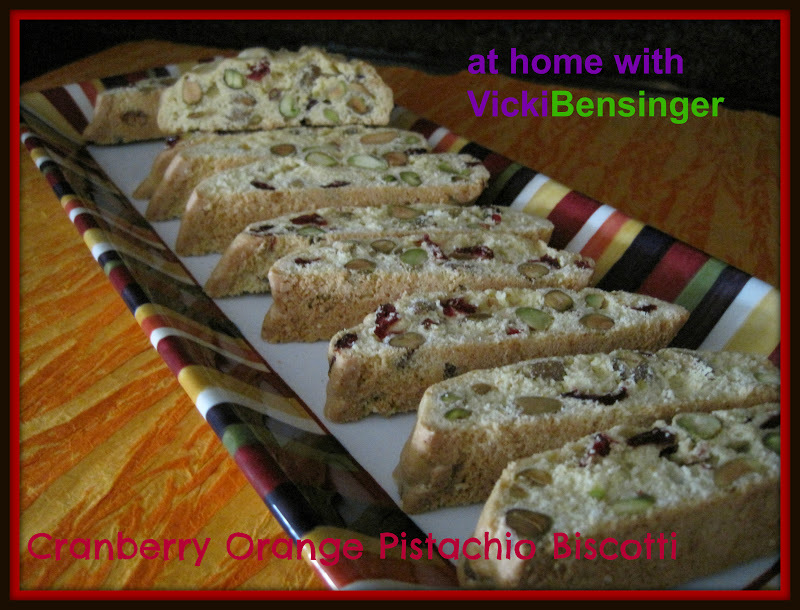 With the holidays quickly approaching, all I feel like doing is baking – cakes, cookies, pies, and biscotti. 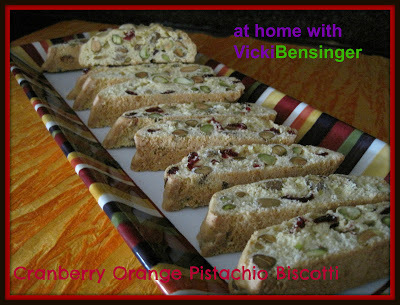 I love biscotti and never feel stuffed after eating one or two. I love them with my coffee, tea or even as a midday snack. They’re so light and delicious! 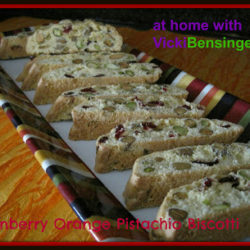 A favorite recipe I’ve been making for years is Cranberry Pistachio Biscotti. After viewing a biscotti recipe on one of the many blogs I frequent, I decided this morning when I woke up that I was going to make mine – however, I thought I’d change it up a bit. I had some delicious Blood Orange Olive Oil that I purchased from a store that recently opened at Plaza Frontenac in St. Louis, called DiOlivas. I love Olive Oil and Vinegar stores as you’re probably aware, if you’ve been following my blog for a while. With a myriad of choices, each one delicious and unique in their own way (I was able to sample whatever I wanted), I walked out with quite a few varieties to take home and create, culinary masterpieces! DiOlivas is a locally owned family business, so if you live in or around the St. Louis, Missouri area you should definitely pay them a visit. If not, you can always purchase their products online – everything I tasted was so good, you can’t go wrong with any of them. So, this morning I decided to make biscotti. Instead of my usual recipe that I often make during the holidays, I decided to use my Blood Orange Olive Oil instead of plain Olive Oil, plus, add the zest of an orange. OMG! You have no idea how moist and delicious these were! Even my daughter said they were the best biscotti I’ve ever made. So of course I knew I had to share the recipe with you. I know you’re going to love them. Besides making them for yourself, don’t forget to package some up to give as a holiday gift. Who wouldn’t love these? 1. Preheat oven to 300F degrees. Spray cookie sheet with non-stick spray and line with parchment paper. 2. Using an electric mixer, blend olive oil and sugar together. 3. Then add vanilla and almond extracts and eggs, beating until the mixture is completely blended. 4. In a small bowl, whisk together flour, salt and baking powder until thoroughly combined. On low speed, gradually add to the egg mixture. 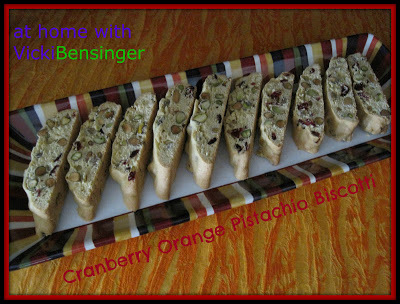 Fold in orange zest, pistachios and dried cranberries. 5. Divide dough in half. On the cookie sheet, form each half into a log about 12 inches long and 2 inches wide. Space logs about 4 inches apart. (Dough will be sticky so lightly moisten hands in cold water before forming into logs). 6. Bake in center of oven for 35 minutes or until the logs are light brown. Remove from oven and turn heat down to 275F degrees. Let logs cool on baking sheet 10 minutes. 7. With a large metal spatula, remove the logs to cutting board and using a long, sharp knife, cut each log on the diagonal into ¾ -inch slices. 8. Stand slices upright on cookie sheet and return to oven for 8-10 minutes, until they are light brown. 9. Cool biscotti on rack and store in a tin between sheets of waxed paper. They can be kept at room temperature for up to 2 weeks.